direct it towards the grease filters. channel and then into easily removable grease trays. Fresh Air Supply provision is made through the louvers on the front Portion of the hoods. 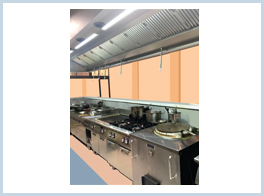 Hanging brackets are fitted to the top corners of the canopy for easy installation. The filter is designed to extract grease from cooking equipment. The semi-circular channel construction of the filter guarantees the highest attainable grade of grease extraction by creating a centrifugal force in the filter. The grease collects in the lowest part of the filter preventing clogging and maintaining an even extraction over the entire length of the ventilation system.The filters are placed at an angle of approximately 45° in the canopy and are easily removable. for the out stream of grease and moisture. The filters are resistant to aggressive detergents. Simple to remove without tooling, Easy maintenance in any commercial dish wash machine installation. the requirements of IP54 and come complete with electrical terminal connection box. Standard electrical supply is 220/240V 50Hz. The below given sizes are standard. We can customise as per requirement.